New Case Cutlery Kodiak Hunter 10 1/2" overall. 6" mirror polished stainless blade with Kodiak Bear etching. Black leather belt sheath. You can expect our service to be friendly and professional. So we wish for you to only to have a positive experience. China Made Motorcycle Knife 4 3/4" closed linerlock. Push seat to turn on white LED headlight. We Provide Free Local Pick Up on all orders. Buy It Now. Why buy from us. Orders must be Prepaid before Pickup. This new for 2018 Zero Tolerance is outstanding. The Sinkevich design ZT 0462 has pushed all of the buttons. The red and black carbon fiber fits the hand oh so well. Custom pivot point is spot on and really ties it all together. Frost Cutlery Knives 3" closed lockback. 2 1/4" stainless blade with thumb slot. Frost Cutlery Knives 3" closed lockback. Brushed stainless handles. MPN: F15483SS. 5 out of 5 stars - Frost Cutlery Knives 3" closed lockback. 2 1/4" stainless blade with thumb slot. 2 product ratings2 product ratings - Frost Cutlery Knives 3" closed lockback. 2 1/4" stainless blade with thumb slot. China Made Knives 3 1/2" closed. Stainless razor blade and skinner blade with th. Stainless razor blade and skinner blade with thumb slot pull. MPN: CN210412. New China Made 3 1/2" closed. Stainless razor blade and skinner blade with thumb slot pull. Eye & Ear Protection. We Provide Free Local Pick Up on all orders. UTG Scopes. Mueller Scopes. Orders must be Prepaid before Pickup. 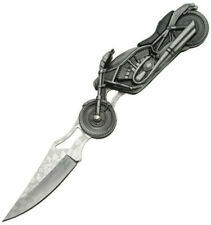 New China Made China Made Motorcycle Knife 4 3/4" closed linerlock. 3 1/4" stainless blade. Push seat to turn on white LED headlight. We Provide Free Local Pick Up on all orders. UTG Scopes. Mueller Scopes. Tactical SURVIVAL Hunting Combat BOWIE Wood Fixed Blade FULL TANG Knife Sheath Skinner Knife Leather Sheath. Defender 9" Tactical Fixed Blade 9396 Survival Wood Handle Bowie Full Tang Hunting Skinner Knife With Leather Sheath. China Made Razor Folder Knife 210412 3 1/2" closed. Stainless razor blade and sk. Stainless razor blade and skinner blade with thumb slot pull. We Provide Free Local Pick Up on all orders. Why buy from us. 2 1/4" stainless blade with thumb slot. Brushed stainless handles. We Provide Free Local Pick Up on all orders. Why buy from us. KnifeGuy78 >. Orders must be Prepaid before Pickup. » All PRODUCTS. Quick Overview.